One good reason for getting out of bed early: you might get a bulb out a street lamp! It so happened they were changing the bulb in the one outside the house so I rushed out and asked for the old one. No problem! I found out it will run happily off a neon sign transformer. The glow is actually purely neon, there is no sodium left in the lamp. Discovered that it will run off an electronic ballast (from uni skip!) meant for a fluorescent light. Much brighter than the NST. 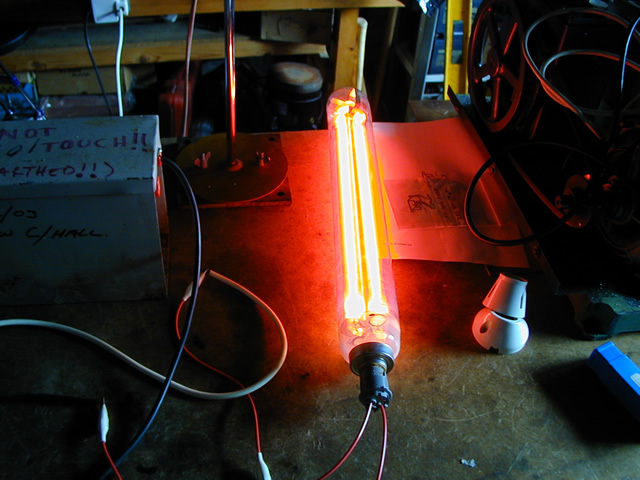 One note with the electronic ballasts: you have to make them "see" a "proper" fluorescent tube. What I did was use two 100W 20Ω resistors to mimic the filaments in the tubes and then connect the street light across the two "filaments". It ran quite happily.